Orrville Red Rider Sports Blog: Season of Dreams....One to Go!! Simply can't describe what I saw today in Columbus. I'm out of words...and that's saying something. Of all the moments & memories that have been experienced in Columbus by our all of our great teams in the 1990's and in 1980, today may have topped them all. Sam Miller, a senior & Kent State football commit, corralled a Jacob Bolyard miss and was fouled with 1.8 seconds left. He proceeded to calmly (at least it looked calm) drain 2 free throws and give the Riders a heart-stopping 50-48 win over Columbus Bishop Ready. The win gave the Riders a shot at the Division 3 State title on Saturday morning (10:45am) against the Thunderbirds of Lima Central Catholic, who have won 19 straight games. 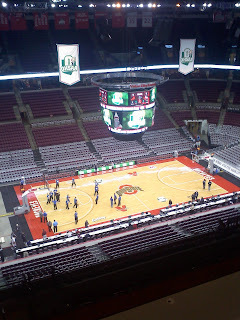 ***Took that pic before I took my perch on press row (down low). Sat next to former Orrville girls coach Marcie Alberts who did play-by-play for WTIG 990 out of Massillon. Let's talk about the rest. 1. First and foremost, let's talk about the clutchiness of Mr. Samuel Miller. Kid is just money in big games. Nevermind his 50% free throw shooting....he's now 2 for 2 in free throws with 1.8 seconds left on clock in state semifinals. Those just might be the biggest free throws in Orrville history....and I'm so glad Sam got to be the guy to send us to the finals. 2. You knew Ready had a run in them...and boy did they ever make one. Orrville was up 35-27 at the end of the 3rd, but Ready would go on a 15-2 run in the first 4 minutes of the 4th, and seemingly take control of the game. A typical team may have wilted and thrown in the towel....but this Rider team is no typical team. 3. Jake Bolyard's sick 3 point shot from 24 feet out tied the game at 42, and was just pure guts. He worked hard for all 13 points, but those 3 were ginormous. 4. I asked Sly in the post-game press conference (yep) what he said during the timeout when Ready made their big run...and he said "not much." Said the kids know what needs done, and all he does is settle everyone down and let his leaders lead. 5. The defensive effort on Ready All-Ohioan Joe Graessle was outstanding. He was 6 of 20 from the field, and a shaky 2 for 11 from 3-pt range. At times, he was downright frustrated by the defense of Max and Chase. He was a very enjoyable player to watch, but I liked the effort of our kids a little more. He scored 16, which is about 10-12 points per game less than his tournament average. 6. I just cannot believe that we're 1 win away from a state title. It defies logic (almost). Simply cannot say enough for what Coach is doing. How much of a grace period has this earned him? Seriously, can anyone complain about anything for at least 5 years? If he brings home a state title, we could be talking about a lifetime exemption. How would he even begin to try to top this season? 7. If we win on Saturday, a celebration will take place in the auxiliary gym connected to Value City Arena immediately following the trophy presentation. There will be no "welcome home" celebration in Orrville on Sunday. The Orrville/Lima CC game will be broadcast live on SportsTimeOhio starting at 10:30 on Saturday. Set your VCR's or DVR's or PVR's...or whatever you need to do. But don't miss it. I'm spent...still hard to believe. Someone pinch me.